Signs of Community (SOC) recently provided a local elementary school with a community announcement center, with the mission of enhancing communication with students, parents, and staff, while relaying important messages to their local community. It’s great to see cities and school districts recognizing the power of these announcement centers and utilizing them in the best ways possible, keeping their local communities informed and bettering their own communication on campus. 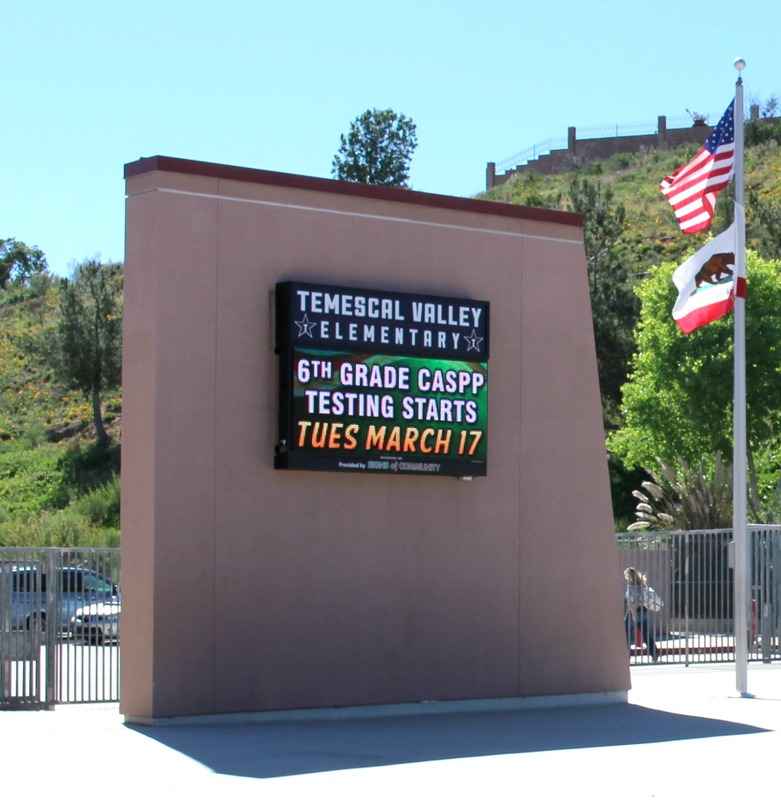 Temescal Valley Elementary, of Corona California, provides their students with a “star quality community for learning, listening, and laughing.” The school takes great pride in maintaining a positive learning environment for their young students. 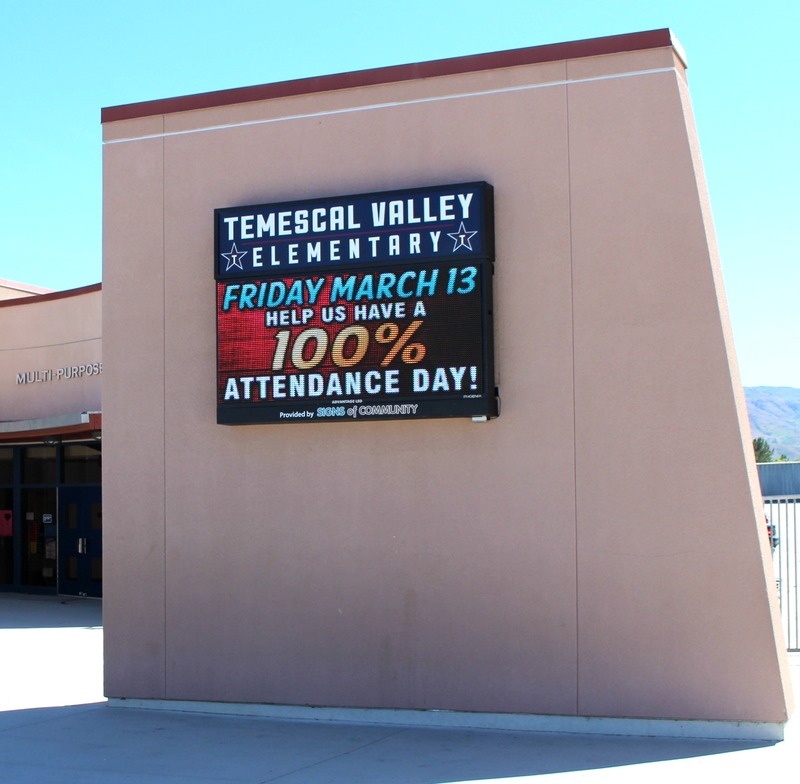 With many activities geared to engage their students and encourage their growth, the school district worked with Signs of Community to provide Temescal Valley Elementary with an announcement center to enhance their communication internally and boost community involvement. Signs of Community (SOC) is a non-profit organization that helps cities and school districts set up outdoor community announcement centers in order to keep communities informed about events, updates, and alerts, with the ultimate mission of boosting community involvement. Local businesses contribute to make these announcement centers a success. SOC assumes full financial responsibility to provide, maintain, and operate the announcement centers, ensuring they are functioning and displaying strong, dynamic content that alerts and informs the community. Not only will the announcement center display the school’s messages, but it will also display important messages to keep the community informed. With SM Infinity cloudware backing their announcement center, the school has the capability to enable IPAWS (Integrated Public Alert Warning System for LED and HD digital signage systems). The feature allows the school to automatically display emergency alerts from local, regional, and federal organizations, keeping their community informed and safe. The design team behind SM Infinity also provides professionally-designed, dynamic content that ensures their announcement center is capturing the attention of parents, students, and passersby. 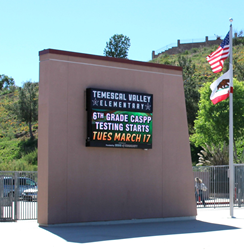 Temescal Valley Elementary has a vast offering of extracurricular activities and parental involvement opportunities. The school has a “Super Dad” program where students’ fathers are allowed to come to the school and spend the day participating in their children’s daily activities. There is also “Superhero Day” in which students and staff dress up as their favorite superheroes. Additionally, the school hosts an annual book fair, food drives, blood drives, as well as family movie nights. Their new announcement center will allow the school to communicate logistics of events with parents and staff, resulting in higher participation and better organization. 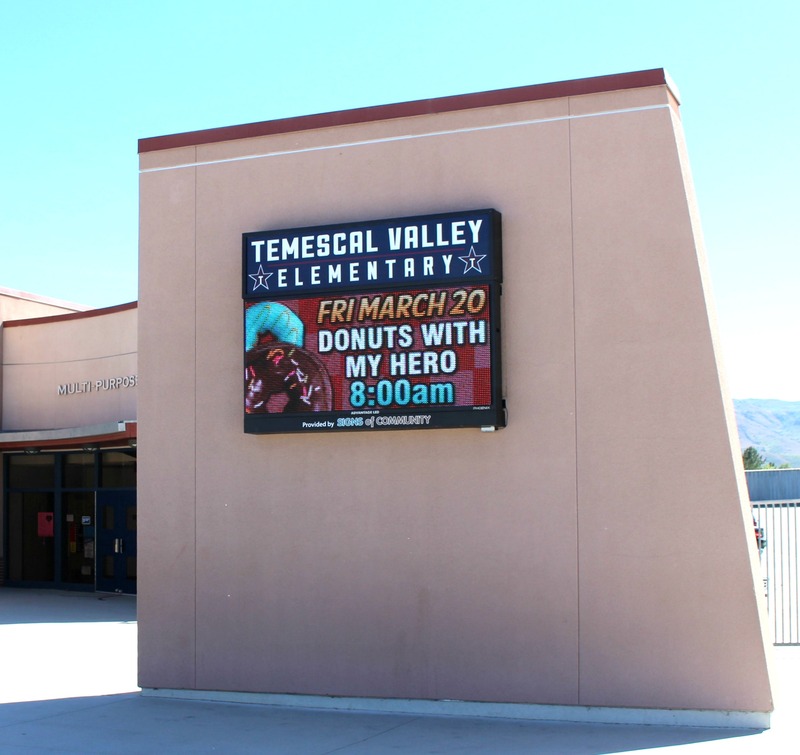 With their new announcement center that is an extension of their school and the great people behind it, Temescal Valley Elementary is certainly instilling a five star mentality in their students and their local community.